Spring has sprung and love is in the air. Couples that became engaged over the last several months are starting to plan their forthcoming nuptials. 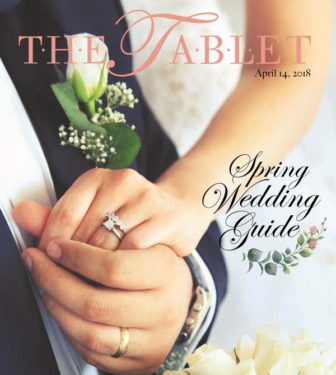 The Tablet’s Spring Wedding Guide is designed for all of the newly (and nearly) engaged, as well as their families and friends, to assist in the exciting journey ahead – not only ensuring the couple has a wonderful wedding day, but also preparing them for a lifetime of love and happiness in union with God. To start you on the right track – practically and spiritually – this Wedding Planning Checklist can help. Engagement Challenge: Choose to go for grace, not perfection. Always on the go? This mobile-responsive marriage site is for you. Will this attraction and affection last forever? Husband and wife, David and Amber Lapp, tackle that question and share how married love grows richer. Before deciding on the wedding budget or joining bank accounts, future brides and grooms will want to get personal finances in order. What makes a Catholic marriage different from other unions that exist in today’s world? Shared love for Christ. Marriage preparation is the starting point for Catholic and interfaith couples exchanging vows in the Church. Couples have the option of traditional pre-Cana sessions or a weekend-long Engaged Encounter experience. Traditional wedding registries are getting a reboot with high-tech trends toward touch-free faucets and digital showers. Consider these kitchen essentials for foodie couples. Prayer is key to living the vocation to married life. Engaged and newlywed couples will appreciate some books to guide them on the path ahead (These also make great engagement/shower gifts). Engaged and married couples can benefit from the ‘Made For Love’ podcast, which features real-life stories of couples navigating their way through married life at every stage. Grow in faith while getting fit for the big day with a workout for body and soul. Make the happiest day of your life free from chaos: Say ‘I do’ to being organized. Budget-friendly bubbles make a great choice for an engagement party or casual wedding. Decided on a wedding day gift exchange? Find the ideal gift for the bride-to-be. Save the date! You’re invited to hear newlyweds Jerry and Meg Rodriguez talk about their journey to and through Catholic marriage – a counter-cultural calling in today’s world – and ask them what you need to know at Grilling with God. Honeymoon: See the top 10 hot spots and ease your travel with this tip.